Closely following the French original, The Target begins with a man on the run from a pair of gun-totting thugs. He takes a bullet and winds up in hospital but in so doing manages to temporarily escape his chasers. A nurse in the hospital is forced to help the man escape from both the police and his attackers when his pregnant wife is kidnapped. Unable to trust each other, the two men battle for their lives as a web of conspiracy gradually begins to reveal itself around them. At 84 minutes and with breakneck pacing, the French original is about as lean as thrillers come. The Target is only marginally longer (at 95 minutes) and keeps the focus on action, yet it also amplifies certain dramatic aspects of the plot, adding a familial connection between the mercenary and his kidnapping accomplice. This essentially allows for a narrative context in which Ryoo Seung-ryong's tough-as-nails protagonist can show off his emotional side. Initially, The Target is on the mark as it throws us into a tense chase sequence taking place on a rainy night. The pace is quick, the threat is palpable and noirish lensing, such as a shot chronicling the action through the reflection in a puddle in the tarmac, amp up the atmosphere. The film remains taut following this opening salvo but what doesn't stick around is the promising tone as the production's staging quickly loses its verve. Though gritty and sporting a couple of solid set pieces, the original isn't exactly a masterclass in genre filmmaking to begin with. The Target is a little more polished but that glossier sheen also makes it feel more sterile. What's more, the melodrama that is inserted into the remake feels tacked on as it threatens to force apart the densely packed plot machinations with its overwrought sentimentality. Thankfully it doesn't derail the entire film but by diluting the film's strong suits and lacking any credibility on its own, it makes the narrative feel sluggish. It's never boring but it's hardly the scintillating thriller it was hoping to be. Ryoo has been a formidable character actor for many years and his recent jump to leading man status was cemented with the success of last year's smash hit Miracle in Cell No. 7. In The Target he's suitably gruff and stoic (at least until the dramatic denouement) but his performance is cool and calculated to the point that it becomes uncharismatic. Lee Jin-wook is little more than serviceable as his good guy foil while Yu Jun-sang is most memorable as he hungrily chews his lines yet in a film that ultimately feels a little drab, his borderline maniacal performance feels out of place. Director Chang demonstrates once again that he has a solid command of genre formula (he previously made 2008's popular horror film Death Bell) but his latest effort lacks the flair and grit to outdo the original. Point Blank ends with a strong sequence that features many small strands chaotically weaving across each other in a claustrophobic and busy location. 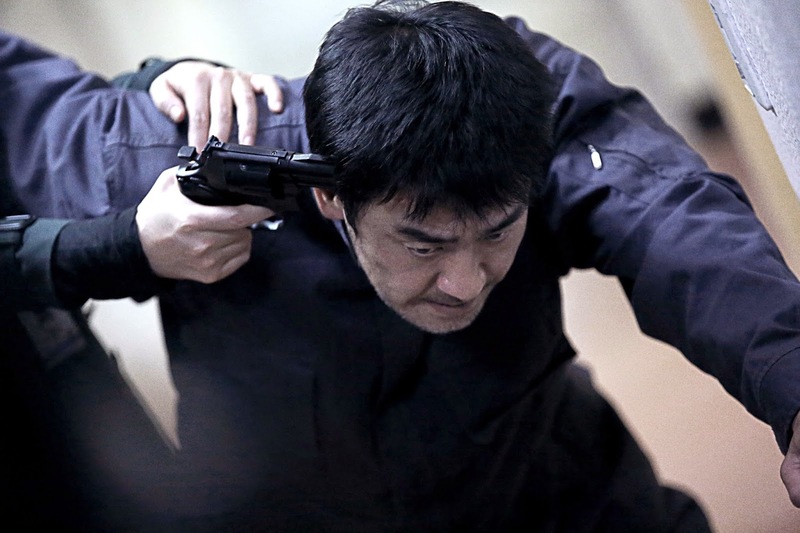 The Target uses the same elements and the same location but instead of mounting the tension through details it opts for a more bombastic yet simplistic approach, that echoes far too many recent Korean thrillers climaxes. The Target may not be as good as All About My Wife or Cold Eyes, but with 2.6 million admissions and counting (not to mention an invitation to Cannes' Midnight Screenings), to their 4.6 million and 5.5 million tickets sold, Korean studios will see no reason to stop reappropriating successful world cinema titles for local audiences.